Oh how I wish we could send in the bulldozers now and get rid of this puffed up, third rate - yet dangerous - talking shop opposite the palace! What price democracy .....Not sure we should be holding up any big candles for Westminster given current scandal(latest in long list). I agree that Spain's response to the Catalan vote was cack-handed. The National Police and Civil Guard were ordered to stop this by the judiciary and therefore it was bound to end in acrimony. Which it's exactly what Nationalist politicians like Puigdemont, Salmond & Sturgeon hope for. It plays into their victimhood narrative for support. Poor Salmond must rue the fact that he couldn't use this card in 2014. I just find it embarrassing to Scotland that the SNP would support such a declaration when only a minority voted and they know full well that it's not supported by any opinion poll of Catalan independence. It shows the rabidity & non-sense of SNP Nationalism that not only seek to divide Scots and the UK but ignore the rule of law that their 'beloved' Europe depends on. Great piece should be compulsory reading. Didn't the south also try and secede from the North ? how did that work out for them ? Still had slavery and Jim Crow well into the 20th century and they still struggle to this day. If you want to shine a beacon on the plight of Catalonia the United States is a poor choice. They are still trying to make it difficult for the poor and mostly black to vote in America today, saying that the Catalonia parliament seem only content with pro independence folk getting the vote as well, whether at the ballot or in the parliament itself . Just as Scotland, Wales, England and Ireland became the UK which you claim should not be broken up, so too did the UK join with other countries to become the EU. By breaking away from the EU, the UK (mostly England) is showing the worst type on Nationalism I've experienced in my lifetime. Why is British Nationalism OK, but Scottish Nationalism and it's equal desire for self determination not? As other's have stated history has shown that many multinational states have successfully split and their member nations achieved independence. Some like the Balkan States and some of the former Soviet Union states through bloodshed but I doubt any of them would agree with your German de-unification hypothesis. The US, Canada, Australia, India, Pakistan, Algeria, most commonwealth countries, French, Spanish, Dutch and Portuguese colonies have became Independent and thrived. 1. Our Representative Democracy works on the principle that we, the sovereign electorate, can remove and replace the MPs at each election. This implicitly depends on the Parliament to take no measures that are virtually irreversible, as joint the EU is, and on the Parliament being open and honest in their decision making rather than by government signing major international treaties without informing the public. It also relies on the existence of a functioning Opposition, whereas in the case of EU, all major political parties were complicit in hiding proceedings from the public, by ignoring the public whenever we raised questions, and by the Opposition conspiring implicitly to act with the government. 2. EU is an undemocratic autocracy by design, and it is a great tragedy for an old democracy that is Great Britain to be absorbed by it and dissolved in its murky waters. 3. This generation of Brits have inherited freedom, democracy, and self-determination by the hard work and sacrifices of our predecessors. It is our duty to nurture it and to pass it on to future generations, rather than to destroy it. 4. I hope that when the dust settles, our constitution will place explicit boundary on the power of freedom, and allow for that boundary to be extended only for specific purposes and after full public consultation and agreement. Obviously Parliament should be prevented, for example, from passiing defence decisions to Russia in exchange for them selling us oil at a discount. The most amusing aspect of this for me has been watching Scotch Nats getting angry at the British Government over what Spain is doing - as if Spain offers a glimpse of our own future. "You're going to do that to us one day aren't you? Or you're thinking about it at least. Yeah. You're thinking about it - probably taking notes too. YOU UTTER UTTER BASTARDS!!!" British Government: "What did we do???" The German reference leads us to a very germane (whoops!) point. The Basic Law if the FRG secures the rights of the several States in a way that arouses envy in many territories. 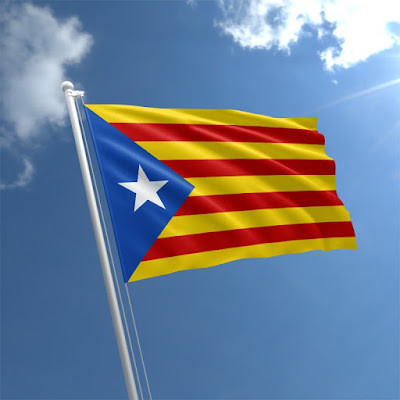 The Federal Government would not be able to treat, sat, Bavaria, in the way that the PP (with, it has to be said, the support of the PSOE) has treated Catalonia. Support for independence was mainly in single figures until Rajoy et al. started dismantling Catalan institutions and attacking the Catalan language. They deliberately engineered this crisis, and only traditional Catalan modes of sense and restraint have stopped it getting worse fast.